Identify past values and trends in electric vehicle (EV) sales to establish a baseline of electric vehicle penetration and to project electric vehicle sales and sales characteristics within the U.S. Compare EV sales by states and evaluate the types of barriers to EV usage and the actions or incentives to overcome the barriers. The object of this research is to present the current market status of plug-in-electric vehicles (PEVs) and to predict their future penetration within the world and U.S. markets. The sales values for 2015 show that China leads in yearly sales at 214,283 (triple increase over 2014) followed by Western Europe at 184,500 vehicles sold. The U.S. is third at 115,262 followed by Japan at 46,339 vehicles. These four countries comprise 95% of the global sales market. The world total of EV sales for 2015 is estimated to be 565,668 up from 315,519 in 2014. The data also shows that the overall world growth is 79% and that Western Europe is now ahead of the U.S. in total cumulative vehicles. Within the U.S., the PEV sales results for 2015 show that 115,262 vehicles were sold as compared to 118,882 vehicles in 2014 which is lower by -3 %. However, sales for the first 6 months of 2016 are 19% greater than the sales for the same period in 2015. On a state basis, California is the largest market with about 55% of the sales for 2015 and a growth of 4.6% in 2015. The total cumulative number of EVs sold in the U.S. over the six year lifetime is now at more than 400,000 vehicles. Looking at the PEV sales data the future world market is extremely bright and is rapidly growing due to the various country policies and to the development of lithium-ion batteries from both a technological and manufacturing standpoint. The current work also evaluated the types of barriers to EV usage and the actions, incentives and research to overcome the barriers. The barriers to large scale EV usage are costs, range, availability of charging stations, charging time, battery life and infrastructure, standard and permitting. Results are presented for overcoming each of the barriers that includes incentives and technical progress. The results show that China leads in yearly sales at 214,283 (3-fold increase for 2014) followed in second place by Western Europe at 184,500 vehicles sold.Â The U.S. is third followed by Japan at 46,339 vehicles. These five countries comprise 95% of the global sales market. The world total of EV sales for 2015 is estimated to be over 565,668 up from 315,519 in 2014. This data also shows that the year-over-year growth is 79% for 2014-2015 (led largely by China) and that Western Europe is now ahead of the U.S. in total cumulative vehicles. The U.S. sales figures for 2015 show EV yearly sales are slightly less than 2014. The major factor for the slower U.S. growth can be mostly attributed to the significant price drop in U.S. gasoline and the resulting increased sale of conventional autos and light trucks. (Light trucks are defined as SUVs, vans, and pickups.) The average cost of gasoline for 2015 was $2.52/gallon as compared to $3.44/gallon in 2014 and the average for 2016 is predicted to be about $2.30/gallon. However, note is made that the sales for the first 6 months of 2016 are 19% greater than the sales for the same period in 2015 and the sales for the month of June 2016 were 45% greater than June 2015. In the U.S., the largest selling EV is the Nissan Leaf with 89,591 vehicles followed by the Chevrolet Volt with 88,750 and third is the Tesla Model S with 63,161 vehicles sold. The U.S. market now has over 26 EV models. Interestingly, the Chevy Volt saw a 79% increase in US sales between January and May of 2016 vs. the same period in 2015, while the Nissan Leaf saw a 39% decrease from levels in 2015. Low sales volume may be influenced by the anticipation of new models. For example, the 2016 Chevy Volt saw significant design changes (e.g. a 24% increase in all-electric range), and consumers may have held off on purchasing a Volt in 2015 in favor of a 2016 Volt. Similarly, the Nissan Leaf is expected to release a new model with around 120 miles of range, and this may be causing some consumers to hesitate purchasing a new Leaf until the 2017 model is available. PEV sales grew globally by around 50% in 2015 and by 223% in China. As of May 2016, world sales are up 48%, and heading towards 800,000 for the year. China has set a target for 5 million new energy vehicles by 2020, and a charging station network to cover these 5 million EVs. India's PEV target is 6 million on the road by 2020, and to electrify the country's entire auto fleet by 2030. China currently has 200 million electric two wheelers. Over the next decade, most of these will convert to lithium batteries. China's lithium-ion battery production tripled in 2015. Over the next two years, 25 new PEV makes and models are expected to be released. Tesla currently is leader in global sales. Ford is spending $4.5 billion to add 13 new PEV models to electrify 40% of its vehicle lineup by 2020. Audi plans to introduce a new PEV model every year beginning in 2018. General Motors has the Bolt coming in 2016. Ian Callum, head of design for Jaguar, commented (April 2016): "Car design will change more in the next 15 years than it has in the past 100; electrification will kick start the biggest change in automotive design in history." Daimler Mercedes Benz comments (in June 2016), "Battery electric cars will be able to run for 500 kilometers between five-minute recharges - and outperform any petrol-powered car on the road - in less than five years." Goldman Sachs comments: "lithium the new gasoline," they forecast 22% EV penetration by 2025, and "lithium demand for all EV applications could grow more than 11x by 2025." The lithium-ion price in China trebled in the past 6 months from 6,000 per tonne, to over 18,000 per tonne. This is mostly due to increased demand from electric vehicles (buses, cars and bikes). 12 lithium ion battery "mega factories" are set to come on line (or expand) by 2020, (with 7 of those in China). Tesla's Elon Musk recently announced that Tesla "could triple the total planned battery output of its Gigafactory to ~105 GWh of cells and ~150 GWh of battery packs”. This is over 3 times the current total lithium-ion battery production worldwide. He also stated around half of this capacity would be needed to cater for the growing energy storage business. EVs accounted for nearly 30% of all new cars sold in Norway in 2015. Norway's four major political parties are readying a bill to ban the sale of gas-powered cars by 2025. Germany announced that by 2030, all new cars registered in the country must be electric vehicles. Beginning with cost barriers, an EV will, in general, initially cost more than the comparable ICE. This negative barrier is balanced on the positive side by an EV cost per mile of about $1 per gallon equivalent for electricity at 12 cents/kWh and minimal to very little maintenance costs. It is also noted that U.S. electricity costs are much more stable than oil prices giving an EV a more predictable future fuel cost value. In 2012, President Obama announced the EV Everywhere Grand Challenge. This Department of Energy (DOE) program has the goal of making PEVs that are as affordable and convenient as ICEs by 2022. The specific numbers are that the EV purchase cost combined with the operating cost and a range of 280 miles will be comparable to that of an ICE vehicle of similar size after 5 years of ownership. The second cost consideration, but not as important as initial cost, is the resale value. Since EVs are just beginning to hit the resale market there is minimal experience. Our experience in purchasing two Leafs for research purposes showed that EVs depreciated much the same as conventional vehicles. But, note is made that EVs do not frequently change body styles and there is a much anticipated public wait for new vehicles with longer range batteries, thus, hurting resale. Any discussion of costs leads to the laws and regulations that both federal and state governments have passed that give incentives to assist EV owners with a variety of usage and cost incentives. At the federal level, there is an EV purchase personal income tax credit of $2,500 to $7,500 depending upon vehicle battery size. Both the Leaf and Volt qualify for the $7,500 value. This incentive will begin to be phased out once an individual model’s cumulative sales exceed 200,000 units. At the state and local levels there are numerous types of incentives. These incentives can be classed as tax credits, registration fee reductions, toll reductions, high-occupancy vehicle lane exemptions, financial incentives, emission test exemptions, parking incentives and utility rate reductions. Again, the Income or Other Tax Credit/Exemption incentive is most important and is offered in 15 states. There are incentives in 37 states. The second and what many EV representatives feel is the most critical barrier is the barrier of range anxiety. There are two solutions to the range problem. The first is to increase battery energy and decrease weight which are DOE technical program goals. The second solution is to research, develop and demonstrate the use of wireless charging and to place the wireless charging within the vehicle roadway of travel. The wireless charging option is receiving expanded R&D and is being tested by researchers at Utah State University which has a wireless track and test bed facility. However, recent reports have demonstrated that the current range of electric vehicles are sufficient for most of daily travel, and the forthcoming 200-mile range PEVs will meet nearly all daily travel needs. Thus, range anxiety is more a psychological barrier rather than a physical limitation that needs to be addressed. See: Z.A. Needell, J. McNerney, M.T. Chang and J.E. Trancik. “Potential for widespread electrifications of personal vehicle travel in the United States”, Nature Energy 1, Article number: 16112 (2016). 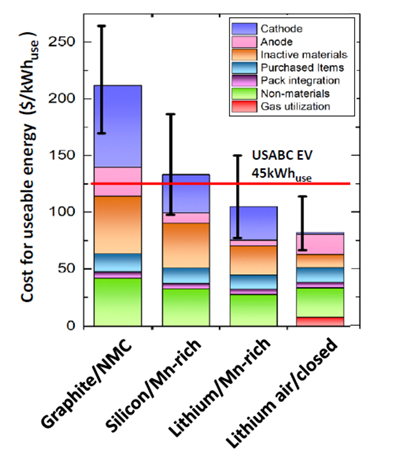 Battery cost and range - In 2016, Christy Cooper (Acting Director of DOE’s Vehicle Technology Office) stated that Li-ion battery costs have decreased by over 70% since 2008 (see Figure 1). In late 2015, GM announced that their Li-ion cell costs were at $145/kWh, with projections to reach $100/kWh by 2022. Anecdotal reports indicate that Tesla may have battery pack costs below $190/kWh. 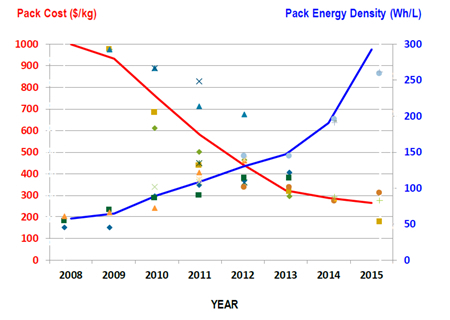 DOE has presented an analysis that illustrates a pathway to achieve battery packs at $100/kWh (see Figure 2). These results were obtained using the ANL BatPaC model, and demonstrate that developing a silicon anode with high capacity cathode represents a low-risk pathway to pack costs around $125/kWh. The higher risk, but greater reward, is to develop lithium metal anodes, which could bring pack costs down to less than $100/kWh. This model represents a “best case” scenario, and does not consider potential chemistry problems or performance limitations of the advanced cell architectures. A major issue facing the development of Si-based anodes is the high performance loss that occurred after only 400 cycles. If this technology is to be employed, more research is needed to develop a mitigation strategy that can significantly improve Si-based anode cycling tolerances. Magnesium alloys - These alloys are challenged by poor corrosion resistance and poor mechanical properties (e.g. strength, stiffness and ductility). Advanced High Strength Steels (AHSS) - These metals have present several challenges in applying them to vehicles, such as a deterioration in mechanical properties in the heat affected zone (HAZ), limited weld fatigue strength, and excessive wear on tooling used to create parts using this metal. Carbon fiber materials - These materials may be able to reduce weight by 30-65%, but they have demonstrated issues related to corrosion and joining with dissimilar materials. Joining technologies (e.g. vaporizing reactive thermite foil adhesion, friction stir welding, laser assisted adhesive) have demonstrated successful joining of more than 14 dissimilar metal combinations. Electric drive systems research focused on power electronics as well as the electric motor. Wide bandgap semiconductors are actively being researched for inverter and charger applications in order to improve the power and efficiencies while minimizing weight and volume. Next generation inverters are expected to achieve the DOE cost target of $3.30/kW, while GaN research expects to provide a 6.6kW converter module with 50% reductions in cost, weight and volume. Electric motor research has developed a non-rare-earth metal magnet with the same volume as the Prius motor, but with increased power. Results for the barrier on the number of charging stations shows that the federal government initially provided heavily subsidized charging station installations and that presently new charging stations are being supported by state or local governments or private firms. Today, the total charging station number continues to increase. In the U.S., there are 13,864 charging stations giving 34,133 public charging outlets. Again, California leads the U.S. with over 20% of the charging stations and outlets. Charging time is not considered a significant barrier since most vehicles are charged at the vehicle owner’s home during the night. Also, DC fast chargers can supply a 90-95% charge in 20-30 minutes. A recent report by Navigant Research has shown that the optimal placing of 95 DC fast charging stations would enable EVs to travel long distances from the coasts and across the nation and that 408 stations would create a comprehensive U.S. network. As a final note, the President’s goal of 1 million vehicles on the road by 2017 now appears to not be achievable, however, the DOE technical goals are progressing according to schedule. The impacts and benefits of predicting the number of EVs are a necessary parameter in all EV planning activities. As new sales data is received, the results will be updated. In addition, the usage barriers and their solutions will be followed and evaluated. This research will support the goals of the Electric Vehicle Transportation Center. Block, D., & Harrison, J. (2014). Electric Vehicle Sales and Future Projections (FSEC Rep. No. FSEC-CR-1985-14). Cocoa, FL: Florida Solar Energy Center. Block, D., & Harrison, J., Brooker, P. (2015). Electric Vehicle Sales for 2014 and Future Projections (FSEC Rep. No. FSEC-CR-1998-15). Cocoa, FL: Florida Solar Energy Center. Block, D., & Brooker, P. (2016). 2015 Electric Vehicle Market Summary and Barriers (FSEC Rep. No. FSEC-CR-2027-16). Cocoa, FL: Florida Solar Energy Center. Block, D., & Brooker, P. (2017). Prediction of Electric Vehicle Penetration (FSEC Rep. No. FSEC-CR-2069-17). Cocoa, FL: Florida Solar Energy Center.